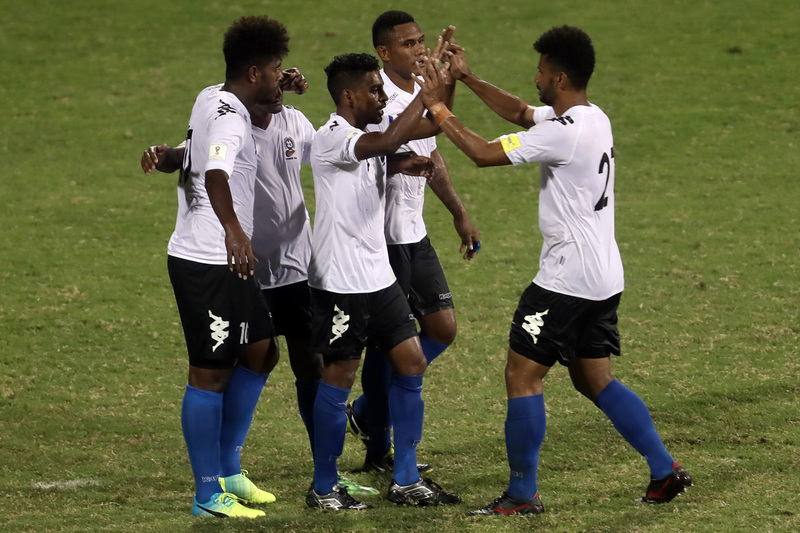 Fiji have drawn 2-2 with New Caledonia in the first of their two 2018 FIFA World Cup Russia™ OFC Stage 3 matches. Fiji: 1. Tevita KOROI (GK), 4. Kolinio SIVOKI, 5. Remueru TEKIATE, 6. Amani VALEBALAVU (C), 7. Epeli SAUKURU, 8. Christopher WASASALA, 12. Saula WAQA, 15. Samuela KAUTOGA, 16. Laisenia NAIOKO, 17. Iosefo VEREVOU, 21. Setareki HUGHES. Substitutes: 20. Simione TAMANISAU (RGK), 2. Vuniuci TIKOMAIMEREKE, 3. Kavaia RAWAQA, 9. Roy KRISHNA, 10. Dave RADRIGAI, 11. Waisake TABUCAVA, 13. Sitiveni CAVUILAGI, 14. Laitia TUILAU, 18. Madhwan GOUNDER, 19. Manav PERMAL, 23. Andrew NAICKER. New Caledonia: 23. Mickael ULILE (GK), 4. Pierre KAUMA, 5. Jeremie DOKUNENGO, 6. Geordy GONY, 7. Joel WAKANUMUNE (C), 8. Emile BEARUNE, 10. Shene WELEPANE, 11. Mone WAMOWE, 12. Richard SELE, 15. Joseph ATHALE, 22. Roy KAYARA. Substitutes: 20. Thomas SCHMIDT (RGK), 2. Romaric WALONE, 3. Iler HNAUK, 14. Didier SIMANE, 17. Willy WAIA.